These exercises are part of an advanced BOSU workout, designed to further challenge you in your quest for improved fitness. 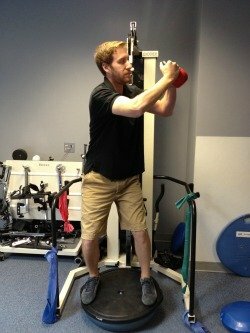 While this website focuses primarily on golf weight training and fitness, many of the exercises listed (including these BOSU ball exercises) are general enough in nature for anyone to perform. 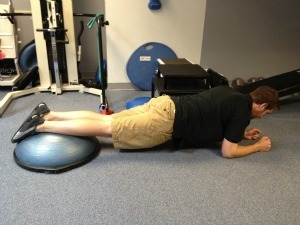 The main advantages of a BOSU workout is the level of instability that the BOSU ball provides. An effective BOSU ball exercise will challenge your limits of stability and will recruit additional muscle fibers that maybe a more traditional, yet similar, exercise would. 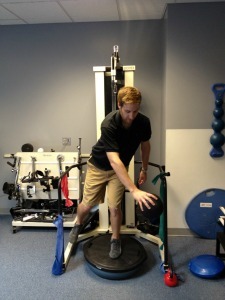 If you are looking for more basic BOSU exercises, please refer to the links section at the bottom of this page for additional resources for each area of the body. -Stand on top of the ball, platform side up. Hold either a moderately heavy medicine ball, kettlebell, or free weight with both hands. -Squat down, and as you begin to rise, lift the weight up and to the right while rotating at your trunk to the right at the same time. -Squat again, bringing the weight back down to chest level. -Rise to standing again, this time lifting the weight up and to the left, combined with left trunk rotation. -A partner is required for this BOSU workout. 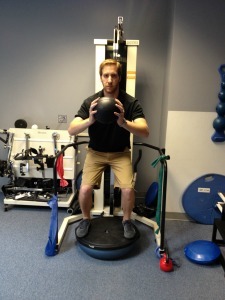 -Stand on top of the BOSU ball, platform side up, facing a partner who is holding a light to moderate medicine ball. -As you squat, your partner should toss the ball to you. -Catch the ball, and as you rise, toss the ball back to your partner. -Balance on your left leg on the BOSU ball, platform side up, holding a light weight or medicine ball overhead in your right hand. -Perform a small single leg squat, while at the same time, lowering the ball from overhead at a diagonal down and to the left, ending on the outside of your left knee. -Return to upright position, with ball overhead. -Perform a set number of reps on each leg, with the ball always in the opposite side than the balancing leg. 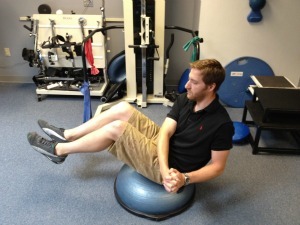 -Sit on top of the BOSU ball, round side up. -Keeping your back straight, lean back and elevate your legs into the air, with knees locked. If someone was looking at you from the side, your body would be in the position of a "V" on top of the ball. -Clench your hands together, and begin rapidly twisting from side to side, trying hard to keep your legs off of the ground. -Sit on top of the ball, round side up. --Keeping your back straight, lean back and elevate your legs into the air, with knees locked. If someone was looking at you from the side, your body would be in the position of a "V" on top of the ball. 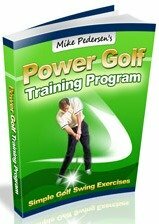 -With a partner standing to one side, toss a light medicine ball back and forth, while trying to maintain the V position. -Repeat with the partner on the other side. -Initially, start on your stomach, propping yourself up on your forearms. -Place your feet on top of the ball (round side up), and try to hold a plank position for at least 5 seconds, if not greater. -For more of a workout while holding the plank, alternate leg lifts which will require much more muscle use and coordination. Didn't find exactly what your were looking for with this BOSU workout page? Check out the links below for my other BOSU ball exercise pages!